Go to original pattern for design DROPS 172-36. 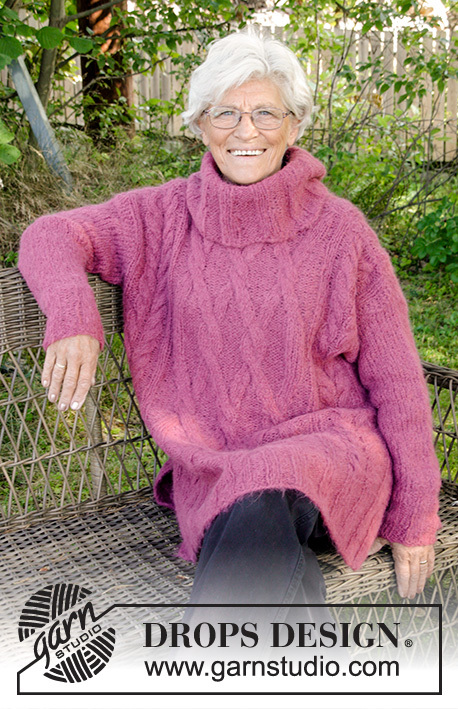 Knitted DROPS oversized jumper with cables and turtle neck in ”Melody”. Size: S - XXXL. DROPS DOUBLE POINTED NEEDLES AND CIRCULAR NEEDLE (40 and 80 cm / 16'' and 32'') size 7 mm / US 10.75 for rib - or size needed to get 13 sts x 15 rows in stockinette st = 4'' x 4'' (10 x 10 cm). 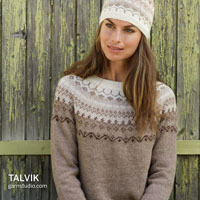 You can get the yarn to make this pattern from	44.10$. Read more. See diagrams A.1 to A.8. The diagrams show all rows in pattern seen from RS. Beg 1 st before marker, make 1 YO, K 2 and make 1 YO. On next round K YOs twisted to avoid holes. Inc 1 st by making 1 YO in transition between K and P. On next round work YO twisted to avoid holes. Work front and back piece back and forth on circular needle. Work sleeves in the round on double pointed needles. 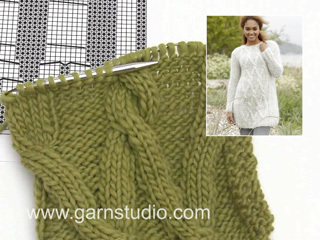 LOOSELY cast on 90-102-102-114-114-126 sts on circular needle size 7 mm / US 10.75 with Melody. P 1 row from WS. Work next row as follows from RS: 3 edge sts in GARTER ST – see explanation above, * K 3, P 3 *, repeat from *-* 0-1-1-2-2-3 times in total (i.e. in size S do not work K 3/P 3), work rib according to diagram A.1 (= 21 sts), work rib according to diagram A.2 (= 42 sts), work rib according to diagram A.1 (= 21 sts), * P 3, K 3 *, repeat from *-* 0-1-1-2-2-3 times in total (i.e. in size S do not work P 3/K 3) and finish with 3 edge sts in garter st. Continue rib like this until piece measures 12 cm / 4¾''. Work next row as follows from RS: 3 edge sts in garter st, K over the first 0-6-6-12-12-18 sts AT THE SAME TIME dec 0-4-1-4-1-4 sts evenly over these sts, work and dec according to diagram A.3 (one time), work and dec according to diagram A.4 (one time), work and dec according to diagram A.3 (one time), K the next 0-6-6-12-12-18 sts AT THE SAME TIME dec 0-4-1-4-1-4 sts evenly over these sts and finish with 3 edge sts in garter st = 70-74-80-86-92-98 sts. Switch to circular needle size 8 mm / US 11 and work back from WS with K over K, P over P and garter st over garter st, but sts in A.4 are worked as shown in diagram. Work next row as follows from RS: 3 edge sts in garter st, 0-2-5-8-11-14 sts in stockinette st, work and inc according to diagram A.5 (= 15 sts that inc to 21 sts), A.6 (= 34 sts that inc to 46 sts), A.5 (= 15 sts that inc to 21 sts), 0-2-5-8-11-14 sts in stockinette st and 3 edge sts in garter st = 94-98-104-110-116-122 sts on needle. Work back from WS with K over K, P over P and garter st over garter st.
Work next row as follows from RS: 3 edge st in garter st, 0-2-5-8-11-14 sts in stockinette st, A.7 (= 21 sts), A.8 (= 46 sts), A.7 (= 21 sts), 0-2-5-8-11-14 sts in stockinette st, 3 edge st in garter st. Continue pattern like this. 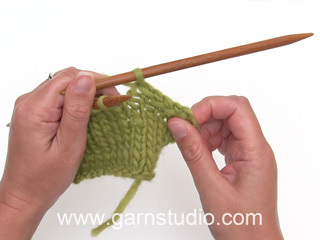 REMEMBER THE KNITTING GAUGE When piece measures 49-50-51-52-53-54 cm / 19¼''-19¾''-20''-20½''-21''-21¼'', bind off the first 0-2-3-6-8-11 sts at beg of the next 2 rows for armholes = 94-94-98-98-100-100 sts (in size S do not bind off any sts but insert a marker in each side to mark armholes). 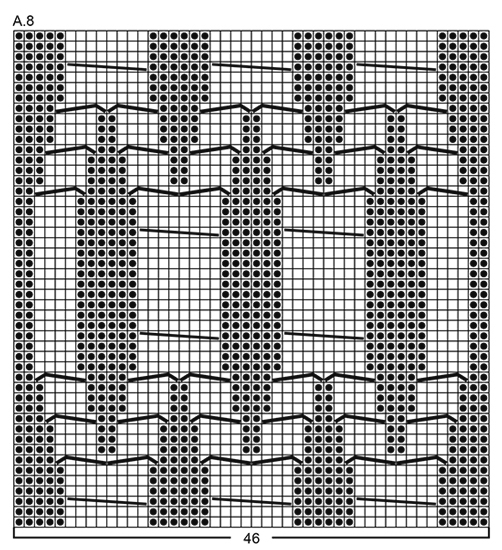 Work next row as follows from RS: 3 edge sts in garter st, 0-0-2-2-3-3 sts in stockinette st, continue A.7, A.8 and A.7 as before, work 0-0-2-2-3-3 sts in stockinette st and 3 edge sts in garter st. Continue the pattern like this until 1 row remains before piece measures 68-70-72-74-76-78 cm / 26¾''-27½''-28 3/8''-29 1/8''-30''-30¾''. Now work sts in cables in A.8 tog 2 by 2 (= 12 sts dec). On next row, bind off the middle 20-20-22-22-24-24 sts for neck and finish each shoulder separately. Continue to bind off 1 st on next row from neck = 30-30-31-31-31-31 sts remain on the shoulder. 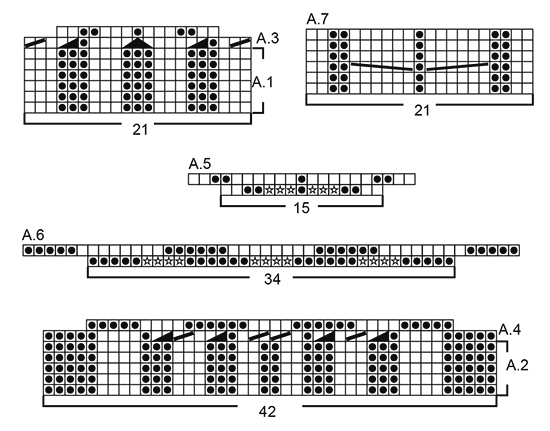 Work until 1 row remain before piece measures 70-72-74-76-78-80 cm / 27½''-28 3/8''-29 1/8''-30''-30¾''-31½. Work sts in the remaining cables tog 2 by 2 (= 6 sts dec). On next row bind off the remaining 25-25-26-26-26-26 sts on shoulder (it is important to avoid a tight bind-off edge on shoulder). Repeat on the other shoulder. Cast on and work as on back piece until 1 row remains before piece measures 64-66-67-69-70-72 cm / 25 1/4"-26"-26½"-27"-27½"-28½". Now work sts in cables in A.8 tog 2 by 2 (= 12 sts dec). On next row slip the middle 14-14-16-16-18-18 sts on 1 stitch holder for neck. Continue to bind off for neck at beg of every row from neck as follows: bind off 2 sts 1 time and 1 st 2 times = 30-30-31-31-31-31 sts remain on shoulder. 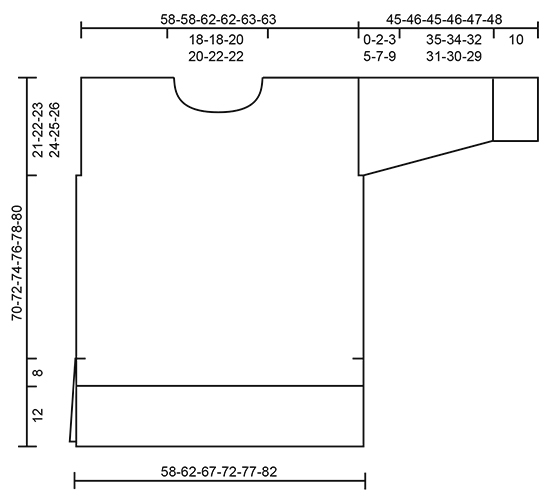 Work until 1 row remain before piece measures 70-72-74-76-78-80 cm / 27½''-28 3/8''-29 1/8''-30''-30¾''-31½. Work sts in the remaining cables tog 2 by 2 (= 6 sts dec). On next row bind off the remaining 25-25-26-26-26-26 sts on shoulder (it is important to avoid a tight bind-off edge). Repeat on the other shoulder. 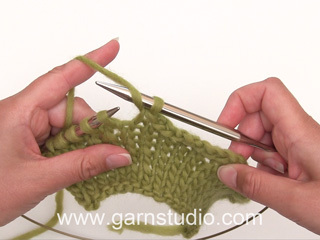 Work in the round on double pointed needles, switch to circular needle when needed. 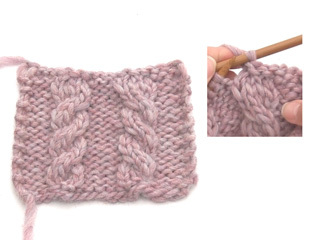 Cast on 30-30-36-36-36-36 sts on double pointed needles size 7 mm / US 10.75 with Melody. K 1 round. Then work rib in the round = K 3/P 3 for 10 cm / 4''. K 1 round while at the same time dec 2-2-6-6-4-4 sts evenly = 28-28-30-30-32-32 sts. Insert 1 marker at beg of round = mid under sleeve. Switch to double pointed needles size 8 mm / US 11 and work in stockinette st. When piece measures 11-11-11-13-13-11 cm / 4½"-4½"-4½"-5"-5"-4½", inc 2 sts mid under sleeve - READ INCREASE TIP-1. Inc like this every 3½-3-3-2-2-2 cm / 1 1/4"-1"-1"-3/4"-3/4"-3/4" 10-11-11-13-13-14 times in total = 48-50-52-56-58-60 sts. When piece measures 45-44-42-41-40-39 cm / 17 3/4"-17 1/4"-16½"-16"-15 3/4"-15 1/4", insert 1 marker at the beg of round. Then work piece back and forth on circular needle until sleeve measures 45-46-45-46-47-48 cm / 17 3/4"-18"-17 3/4"-18"-18½"-19" (i.e. approx. 0-2-3-5-7-9 cm / 0-3/4"-1"-2"-2 3/4"-3½" from marker), bind off (make sure to avoid a tight bind-off edge). Make another sleeve. Sew shoulder seams inside bind-off edge. Sew side seams sew edge to edge - sew in outer loops of edge sts to get a flat seam (make sure to avoid a tight seam) BUT stop when approx. 20 cm / 8'' remain in each side (= vent). Place sleeve in under edge in garter st along armhole (marker on sleeve should fit with side on body at marker). Sew neatly along armhole (edge in garter st along armhole should be on top of sleeve) and in bottom of armhole from marker and in towards garment. Pick up from RS approx. 50 to 64 sts around the neck (includes sts on stitch holder at the front) on short circular needle size 7 mm / US 10.75. K 1 round while inc evenly to 66-66-72-72-78-78 sts. Work rib in the round (= K 3/P 3). When neck measures 10 cm / 4'', inc all K 3 to K 4 - READ INCREASE TIP-2 = 77-77-84-84-91-91 sts. When neck measures 20 cm / 8'', inc all K 4 to K 5 = 88-88-96-96-104-104 sts. When neck measures 22 cm / 8 3/4'', inc all P 3 to P 4 = 99-99-108-108-117-117 sts. Continue rib K 5/P 4 until neck measures 27-27-28-28-29-29 cm / 10½"-10½"-11"-11"-11½"-11½". LOOSELY bind off sts with K over K and P over P - NOTE: Make 1 YO after approx. every 9th st while binding off (bind off YOs as sts) to make the bind-off edge more elastic (bind off YOs as normal sts). I am working on back to the point of ...”Now work sts in cables in A.8 tog 2 by 2 (= 12sts dec)” I’m confused - can you clarify ? Of the 6 cables in A8 I should knit 2tog twice in each cable? Thanks! Dear Carolyn, you have to decrease 12 stitches over the cables in A.8: there are 8 sts in each cable in A.8, K these 8 sts tog (= K2 tog x 4 ) = 4 sts remain and 4 sts have been decreased, repeat this over all 3 cables in A.8 = 12 sts have been decreased. Happy knitting! Hvor kommer rettelsen inn? Rett etter 12 cm vr. bord? Hej Ellen, opskriften på nettet er rettet, så hvis du har skrevet den ud efter 25/8-2017 så er opskriften rigtig. God fornøjelse! Bonjour, je me demandais si avant le 70 cm de longueur (taille medium) si on pouvais diminuer dans les torsade de A.8 2 par 2 à n'importe quel rang ou si cela est à un rang spécifique parce que diminuer dans un rang ou on est rendu a faire un torsade cela ne doit pas être évident. merci a l'avance. Bonjour Marie, oui, peu importe le rang, ce qui compte c'est de diminuer le nombre de mailles de la torsade pour conserver la bonne largeur quand on va rabattre les mailles (si on ne diminuait pas, les épaules seraient trop larges). Bon tricot! Bonjour Marie, oui tout à fait, on reprend au 1er rang. Bon tricot! Bonjour Marie, les 3 m end/3 m env après les 3 premières mailles point mousse et avant les 3 dernières mailles point mousse se tricotent en côtes, vous avez ainsi bien 3 m point mousse de chaque côté. Bon tricot! Bonjour, je ne comprend pas c'est écrit: tricoter et diminuer en suivant le diagramme A3 (une fois) tricoter et diminuer en suivant le diagramme A4 (une fois) .. ou faut-il diminuer?? il y a quand même 28 diminutions. Bonjour, les diminutions sont inclues dans les schemats A.3 et A.4. Donc tricoter (et diminuer) en suivant le diagramme A.3 (1 fois), tricoter (et diminuer) en suivant le diagramme A.4 (1 fois), tricoter (et diminuer) en suivant le diagramme A.3 (1 fois)... Bon tricot! Bonjour Marie. Par example, dans la taille M, en même temp que vous tricotez 6 m end, vous diminuez 4 m dans ces 6 m (le 6 m end deviennent donc 2 m end). Bon tricot! 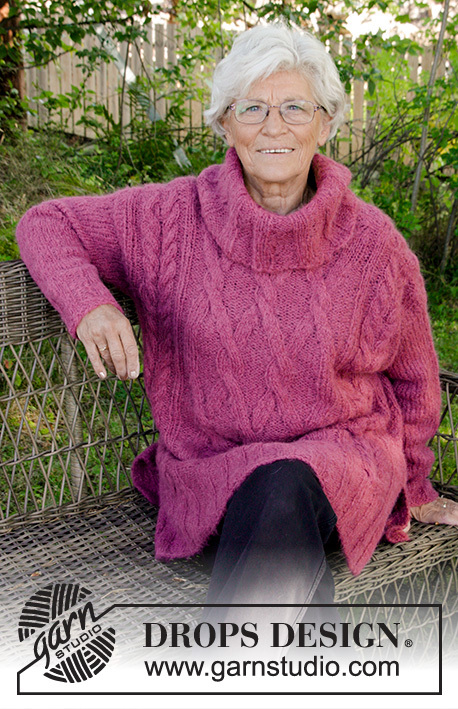 Hei Ingeborg. Vanligvis blir plaggene strikket opp i størrelse S (eller M). For å finne hvilken størrelse som du ønsker, må man se på målskissen helt nederst på siden. Om det er flere modeller som bruker det samme plagget, er det som regel den ene størrelsen som er blitt strikket opp. Bonjour Castagna! 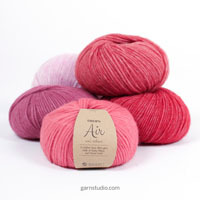 Composition de la laine Melody DROPS: 71% alpaga, 25% laine, 4% polyamide. Bon tricot!